The Great Royal Jubilee Exhibition of 1906 has been a momentous event for the culture and economy of the young Kingdom of Romania. It has also marked, through the elaborate and high quality Neo-Romanian design of many of its pavilions, the onset of the mature phase of this style. 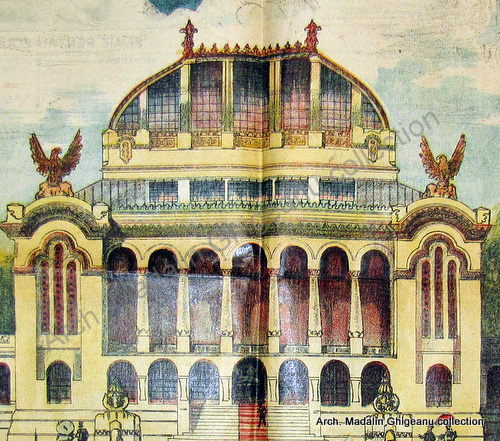 The exhibition’s chief edifice was the Palace of the Arts, presented in the images bellow, which was envisaged as a gathering place of what was considered the finest products of the Romanian people throughout its history. That was also the central message of the event, publicised as as a dual celebration of, on the one hand, King Carol I’s forty years of glorious reign, which saw the gaining on the battlefield of the country’s independence from the Ottoman Empire, the subsequent Europeanisation process and the phenomenal growth of its economy, and also, on the other hand, marking 1,800 years since in 106 CE the Roman Empire under Emperor Trajan conquered the ancient kingdom of Dacia located where in modern times the state of Romania emerged, a historical milestone that ignited the formation of the Romanian people and language. The 1906 exhibition was thus imbued with an intense and picturesque patriotic sentiment typical of the La Belle Époque period that had powerful reverberations throughout the whole of the Romanian speaking world, which at that moment included large swathes of territory under the sovereignty of other states, such as Transylvania in the Austrian-Hungarian Empire or Bessarabia, then a province of Russia. 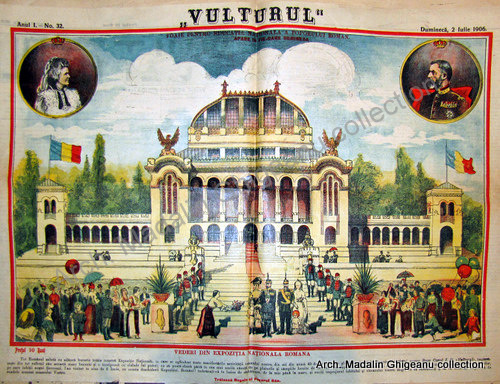 The Palace of the Arts is shown in all its glory in this colour poster published in the monthly magazine “Vulturul” (“The Eagle”, a reference to the country’s coat of arms). The issue date is Sunday 2 July 1906 (in the Julian calendar, in official use then in the country). It presents the official opening ceremony of the exhibition in the presence of the Royal Family and a welcoming public, which took place on 6 June (it closed on 23 November that year). The Palace of the Arts was in a way the Romanian response to the tradition of iconic exhibition buildings inaugurated by the Crystal Palace in London half a century before, epitomizing the ambitious aspirations of that young Balkan nation. It contained a large glazed roof over a central structure embellished with Neo-Romanian style elements and ornaments and also references to the classical architecture, considered then as the purest form of architecture. Its designers were the architects Victor Stefanescu and Stefan Burcus, the contractor being the engineer Robert Effingham Grant, a Romanian of British origins. 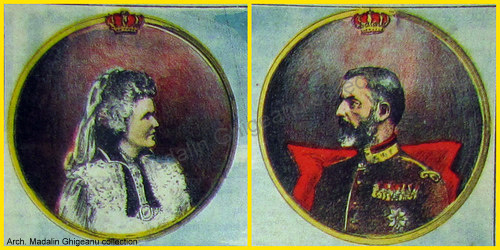 The central figures of this poster were the royal couple, King Carol I, an excellent administrator, brought up and trained in the military industrial complex of the mid-c19th Germany, and his wife, Queen Elizabeth, an internationally renown writer, known after her nom de plume as Carmen Sylva. They are presented receiving the homage of the population and in two prominent medallions flanking the image of the palace. The monarch has been the supervisor of the exhibition works, a role in a way similar to that of Prince Albert for the London event of 1851, while the general manager was Constantin Istrati, an accomplished scientist. The Royal Family is present at the opening, King Carol I (second from right), Queen Elizabeth next to his left, while the Crown Prince Ferndinand and Crown Princess Marie are at his right. 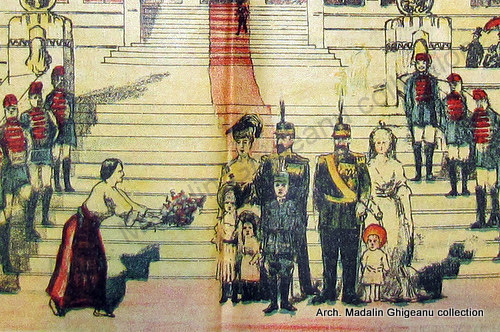 The children of the princely couple are in front, from left to right: Princess Elizabeth, Princess Marie, Prince Carol and on the right the little Prince Nicolas. A peasant woman graciously offers them a bunch of flowers. 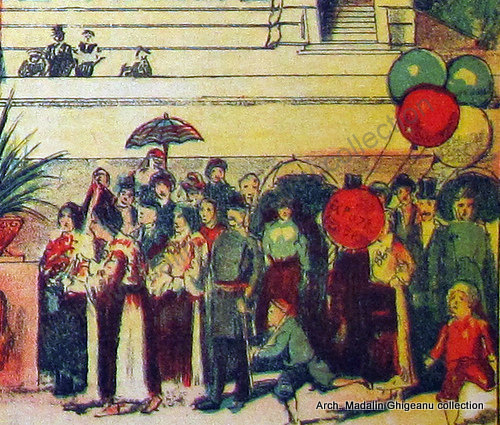 The poster also presents in some detail the public participating at the ceremony, Bucharest people and visitors in a relaxed attitude, proud of their country’s achievements embodied in that great exhibition. 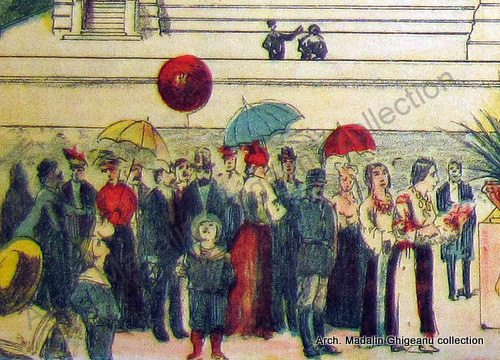 I like the presence of persons wearing peasant costumes, as is the group on the left hand side of the image above, who were probably proper peasants and also higher class individuals, including aristocrats, representing a patriotic fashion introduced and promoted by Queen Elizabeth and Crown Princess Marie, who incidentally were of foreign extraction, the first a German and the second of British and Russian origins, at the local royal balls and other major functions. In 1923 the Miliary Museum of Romania was established within the Palace of the Arts building, functioning until the late 1930s when the building caught fire and later, in 1943, demolished with the intention to erect a more modern museum edifcice. Those plans never came to fruition because of the war and the Stalinist takeover of 1947. However, a grandiose communist heroes mausoleum, which is now probably the most beautiful architectural structure of the communist era, was been built there in the late 1950s. I would like to express here my thanks to architect Madalin Ghigeanu, who kindly provided this poster, part of his ample collection, for publication. Reblogged this on Diana Mandache's Weblog. Absolutely so. All world fairs were imbued with an intense and patriotic sentiment typical of the La Belle Époque period, so we would expect it no less in the 1906 exhibition in Bucharest. And we would expect the Palace of the Arts to be given the central and most symbolic role. What an outsider might not have thought about was the rest of the Romanian speaking world in other states eg in the Austrian-Hungarian Empire. The 1906 exhibition had a role above and beyond the more limited display of national pride. That was the case indeed, the exhibition had a hugely powerful impact among the public (for example the Neo-Romanian architectural style was adopted soon after at the scale of the entire country and even in the neighbouring states that had regions inhabited by ethnic Romanians). This was the cinema, tv or internet of that era. The visitors came from all over the Romanian-speaking world, taking advantage of the reduced price train tickets and free exhibition visiting days, from Habsburg Transylvania or Bucovina, Bulgaria, Greece, or Russian Bessarabia, curios and enthusiastic about their mother-country’s achievements, a foretold of the national unification that came in the aftermath of the Great War.